Wolves won't be the only things howling in Wisconsin's Northwoods this summer. 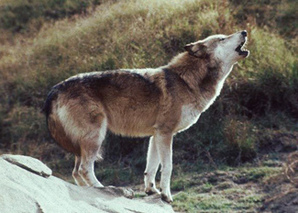 Researchers there plan to set up "howl boxes" that play digital recordings of wolf howls in the rendezvous areas of five wolf packs with the goal of tricking the wolves into believing that another pack has claimed the same territory. If the wolves believe the recordings are real, the theory is they will move to other areas. If proven effective, similar "howl box" technology could be used elsewhere to discourage wolves from congregating in areas where they are not welcome, such as farmland or urban areas, giving wildlife officials another tool to reduce conflicts between humans and wolves. It could prove particularly important in the Great Lakes region, where Endangered Species Act protections prevent wildlife officials from killing or trapping problem wolves. "As the wolf population has grown here in Wisconsin, there's been an intensifying of human-wolf conflicts and increasing depredations," said researcher Christine Anhalt, a graduate student at the University of Wisconsin at Madison who is leading the study. "I think it's really important for managers to have a variety of tools to deal with depredation, and if this is successful, it could be a good tool for managers to have." As part of the study over the next two summers, researchers will compare the responses of five packs exposed to the recordings to a control group of five other packs to determine whether the sound of other wolves howling can move wolf packs out of an area. The wolves will also be monitored to see how far they roam and how long they stay out of an area. The call of the wild is no longer the exclusive terrain of gray wolves. Researchers in Wisconsin are playing digital recordings of wolf howls this summer in the hopes of getting the wolves to abandon their rendezvous areas. Photo courtesy of Wisconsin DNR. Adrian Wydeven, a wolf expert with the Wisconsin Department of Natural Resources, said the technique relies on wolves' own spacing mechanisms. "When wolves hear a strange pack member or some wolves that aren't members of their pack howling at them, that would normally cause them to move away from an area," he said. Wolves typically establish rendezvous sites, the places where they meet after they finish hunting, from the middle of June through the end of September. A pack will use anywhere from a single rendezvous site to a dozen throughout the course of the summer. With Endangered Species Act protections in place for the wolves in the Great Lakes region, Wydeven said wildlife officials have limited options for addressing human-wolf conflicts. For example, officials can put flagging material around pasture areas or set up security devices that sound alarms and flash lights when wolves set them off. Wisconsin has 181 wolf packs comprising about 700 adult wolves. On average, wolves kill about 30 to 40 cattle in the state each year, along with a handful of sheep and the occasional colt, foal, chicken, donkey or llama. Wisconsin officials have used howl recordings in the past to keep wolves away from a farm that had a high depredation rate, and the recordings seemed to initially cause the wolf pack to move several miles farther north. But over time, the howl boxes lost their effectiveness, Wydeven said. However, he noted that the equipment used at the time was far less sophisticated, played the howls at regular intervals, and was kept in the same location the entire time. By contrast, the equipment used in the latest experiment can play the howl at random intervals and researchers will move the box around every couple of days, so that the sounds are not coming from the exact same spot. Michael Robinson with the Center for Biological Diversity said he was not familiar with the Wisconsin experiments, but the method appears to be a promising way to reduce wolf-human conflicts. "The fact that wolves are back on the Endangered Species List and there is no authority for killing them at present seems to be the mother of invention in Wisconsin for preventing conflicts and problems," he said. If the howl boxes prove successful in Wisconsin, they could potentially be used in other areas as a non-lethal means of wolf deterrence. Wolf-livestock conflicts remain a major problem in the Mexican wolf's 4.4 million-acre Blue Range Wolf Reintroduction Area, for example. More than two-thirds of the Blue Range recovery area is permitted for grazing, and cattle can be found year-round on about half of the grazing allotments (Land Letter, March 18). Over its 12-year recovery effort, the Fish and Wildlife Service has removed more wolves than it has introduced, and about half of those removals were due to livestock depredation (Land Letter, March 25). Nevertheless, Robinson said using howl boxes to move wolves out of certain areas would be unwise in the Southwest, since Mexican wolves need far more territory than what is allotted to them in their recovery zone. "We'd be very hesitant to embrace anything that would deny wolves part of the recovery area," he said. In the northern Rockies, where wolves in Montana and Idaho no longer enjoy Endangered Species Act protections, 214 cattle, 721 sheep, 24 dogs and seven other livestock were lost to wolves last year, according to FWS. Nearly one-third of the 267 wolf packs that lived in the northern Rockies last year were involved in at least one confirmed livestock or pet depredation and 25 packs involved in attacks no longer existed by the end of last year, often because of agency control of depredating wolves. In all, 272 wolves were killed last year in the northern Rockies because of depredations. Although wolves in the northern Rockies roam much larger areas than those in the Great Lakes region -- about 200 to 300 square miles compared with 40 to 50 square miles -- several experts said howl boxes could potentially prove useful there if the rendezvous areas were effectively located. "It certainly could be a valid tool to exhaust prior to lethal removals," said Chris Colligan of the Greater Yellowstone Coalition. Suzanne Stone of Defenders of Wildlife said howl boxes have been used in the West primarily to locate wolves, but the Wisconsin study could open up new avenues for their use in the Rockies. "We'll be very interested to see what kind of response they have," she said of the Wisconsin study. "Typically, wolves, when they hear the howl boxes are actually attracted to them, at least in our region, so we'll definitely be looking with interest to see if they can be used as a deterrent as well." Gable is a freelance journalist based in Colorado Springs, Colo.